March 27 is the date! Wow. It’s 5 days until the next show. You know what that means, right? 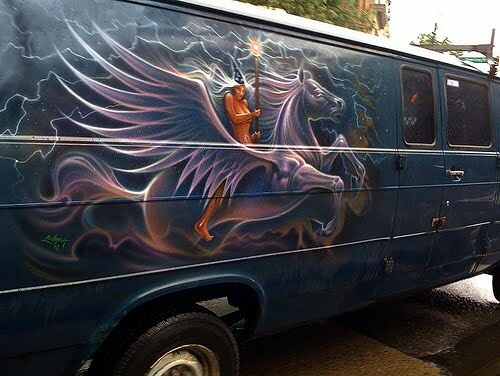 It’s time to pack all of your friends into that sweet van of yours with the Fantasy scene airbrushed on the side and head on out to The Rio Theatre in Vancouver! Don't lie. You think this is rad. It also means there’s only four days to capitalize on the $6.00 advance ticket price. Save yourself two bucks and head to this link to get advance tickets! And remember, if you want to get in, please bring your I.D! This is a licensed event, so the fine folks at The Rio will be required to check. I’m busy buying off-brand soda and devising new and wonderful ways to challenge the players. This is going to be another fantastic adventure. See you all on March 27! Don’t forget to visit this site often for more updates!